We begin our evening in Eastern Market, we park in front of Cutter’s Bar & Grill and head inside, your stereotypical Detroit dive bar, good food, good times. The space is dark, I turn towards a television and let my eyes adjust, the Blues flows from a nearby speaker, the bartender tells us to sit anywhere we want. 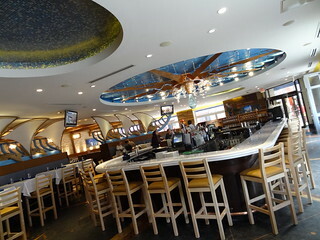 We take a high-top table in the bar area, surrounding conversation leads us to believe many of the patrons are regulars. Yellow paper menus are kept on the tables, we have a look. Burgers are the main feature here, the meat is fresh, never frozen, high quality and hand-pattied; you can get everything from a 4 oz slider to a full 1 pound burger. What catches my eye is the selection of “stuffed” burgers, I read the list of choices, they all sound good, but the 8 oz burger stuffed with pepper jack cheese and pepperoncini is definitely the winner. We wait for our food to arrive, the variety of music changes, some sing along, the restaurant is small and windowless giving no clue as to whether it is night or day. 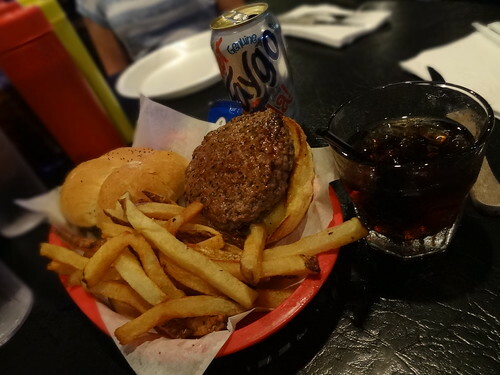 Our burger arrives in a basket along with a pile of hand-cut fries, I dress it up, cut it in half for us to share, and take a bite. The meat is perfectly cooked and tender, the cheese and pepper rings are a tasty addition. The fries are delicious, there is no mistaking these for the typical frozen variety. When the burger is gone we linger long enough for Kris to finish his drink and then we are off; we have a party to go to! 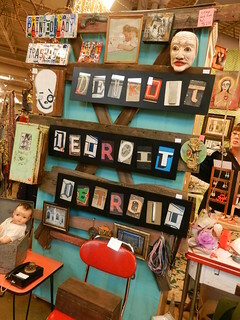 Detroit Mercantile on Russell Street is celebrating its 1st Anniversary and we’re invited. This is one of those shops where you just want to buy everything; each shelf, every display and item is presented in an attractive way. 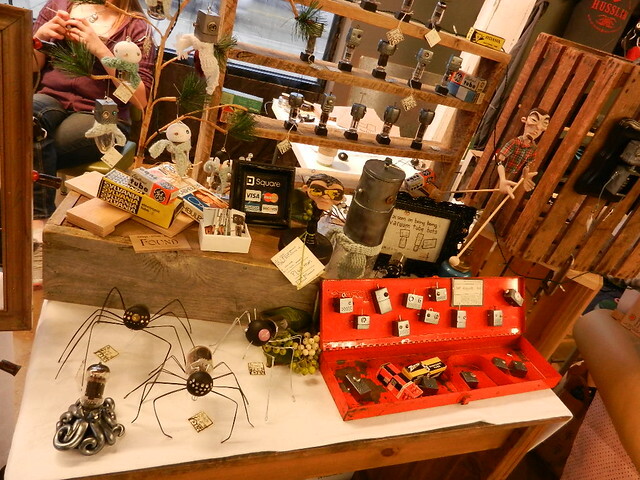 Each item, whether new or vintage is carefully chosen; the store specializes in goods Made in the USA, many are made in Michigan and even more are made right here in Detroit. A large american flag hangs from the back wall, on a nearby shelf I see a vintage roller skate, old Faygo pop cans and a beer stein from Stroh’s. 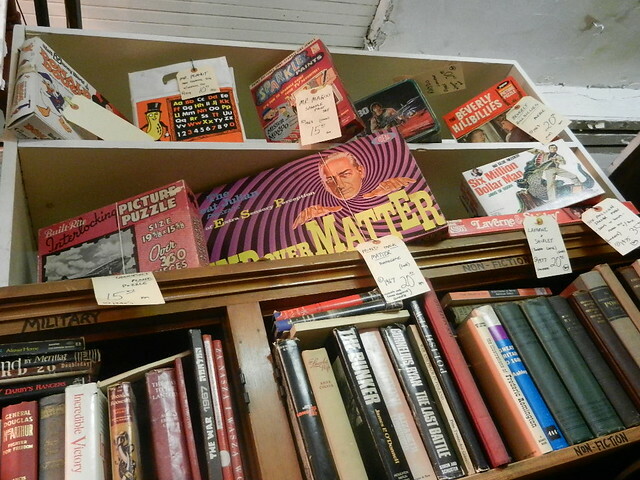 There’s a huge variety of books, they all have something to do with the motor city, I find them stacked on an antique safe and on lovely old trunks. 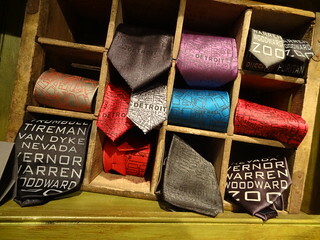 If you are in the market for a Detroit-centric T-shirt, look no further, they have many to choose from. 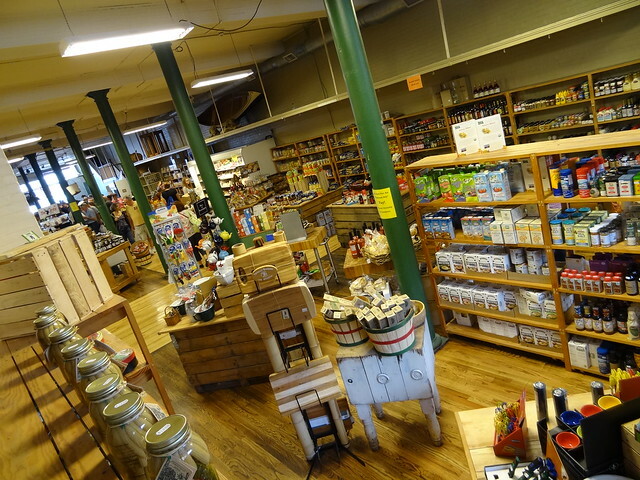 From purses, jackets and Stormy Kromer hats to tins of Better Made chips, handmade chocolates and Germack gift baskets, the store has something for everyone. We proceed through the showroom into the warehouse, this area is reserved as rental space for parties, weddings and events such as tonight. Immediately in front of us on the floor a pair of acrobats are in the middle of their routine, in the distance a woman is sifting through guests on stilts. 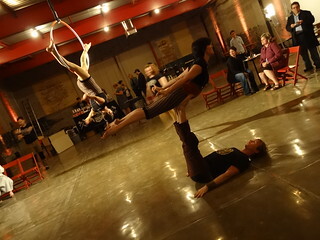 In the center of the room a young woman is performing on the aerial ring, to the left a juggler takes turns throwing a set of three pins into the air; these would all be members of the Detroit Flyhouse Circus. 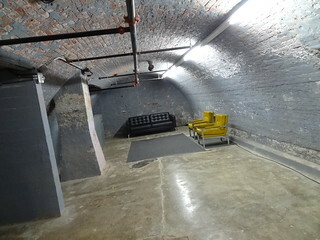 The space is super cool;’ exposed brick and block walls, red ceiling beams and polished concrete floors. Folding chairs are scattered about the space, a cozy sitting area to the right includes a couch and comfy chairs. A representative from Civilized Vodka (Traverse City) is making drinks with Faygo soda pop, next to him they are serving up coffee made from Great Lakes coffee beans. Whole Foods has set up an amazing buffet of cheese, fruit, crackers and wraps, so much to taste! We wander about in the 5000 sq ft warehouse, a weathered car from an old amusement park ride sits off to one side. In the year that The Detroit Mercantile has been in business we have seen them grow from a small showroom, to a larger showroom with the added rental space. 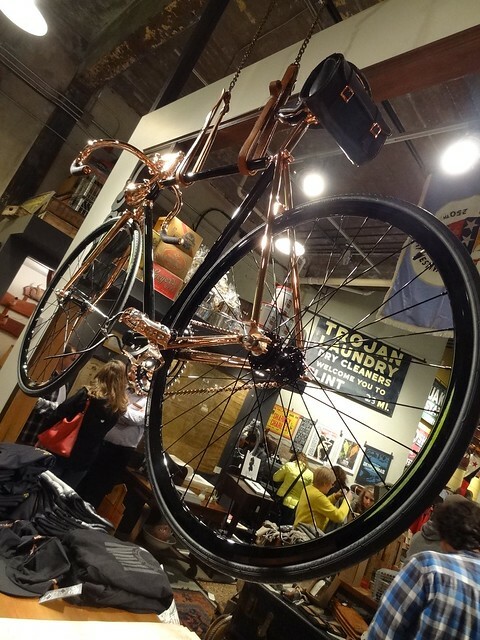 The owners started with a nice variety of goods and now carry everything from jewelry and leather goods to Carhart clothing and bicycles, I can’t wait to see what they do next! 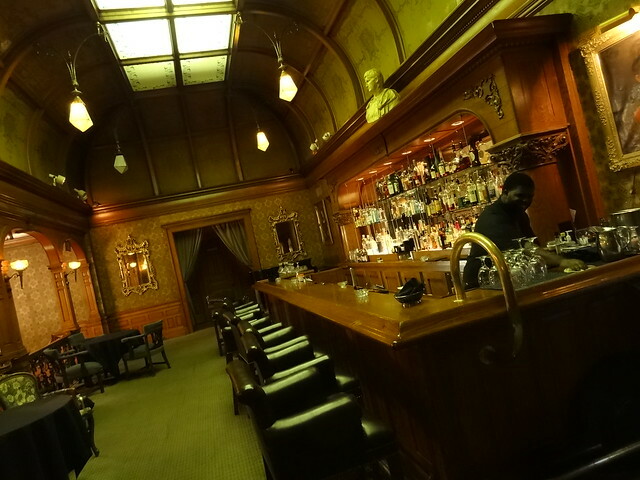 Before turning in for the evening we make one last stop; the Ghost Bar at the Whitney. We enter through the oversized wooden doors, this 1894 mansion turned restaurant is absolutely stunning! 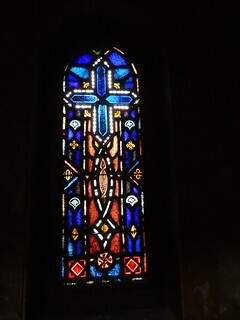 We go directly up the magnificent stairway, passing by elegant stained glass windows, to the third floor. The room is gorgeous; the unique barrel-vaulted ceiling is highlighted with narrow wooden beams, the original skylight is still in tact. We have ourselves a seat at one of the few round tables scattered about and order up cocktails. We sip our drinks surrounded by the elegance of days gone by. 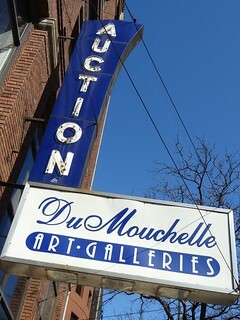 In the past we’ve taken you into some of Detroit’s great places to shop for antiques, today we’ll take you to the finest; Du Mouchelles auction house on Jefferson. 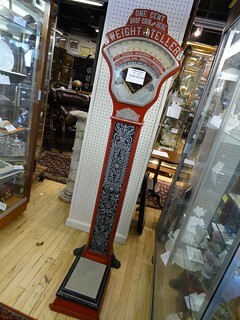 Here you’ll find a selection of top quality antiques, more like a museum than a store. The Du Mouchelle family has been in business since 1927, they are experts in estate appraisals, they buy and sell fine diamonds, gems, jewelry, artwork and objets d’ art; they are probably best known as auction house. Pausing at the front windows, I took a look inside while Kris snapped a few photos of the building. 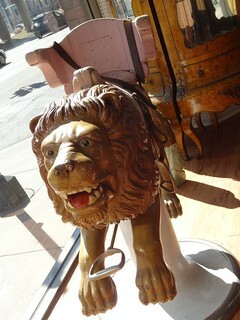 The first thing that caught me eye were beautiful pieces from an antique carousel, a couple of horses and a lion that at one time thrilled children as they rose and fell to the rhythm of loudly playing music. Once inside I was dazzled by the light reflecting off the multiple crystal chandeliers that hang from the ceiling. Kris pointed out a stairway to the second floor, so up we went. 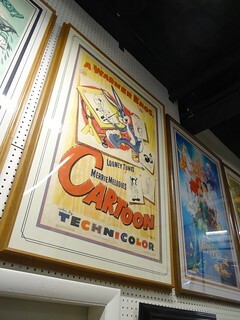 The second floor is an immense space filled with gorgeous things; tall glass cases line the walls and make up rows on the floor, antique paintings, movie posters and cartoons are framed and hang on walls and dividers. As we roam the space I linger at displays of fine china decorated in frilly patterns, crystal pieces and highly detailed figurines. 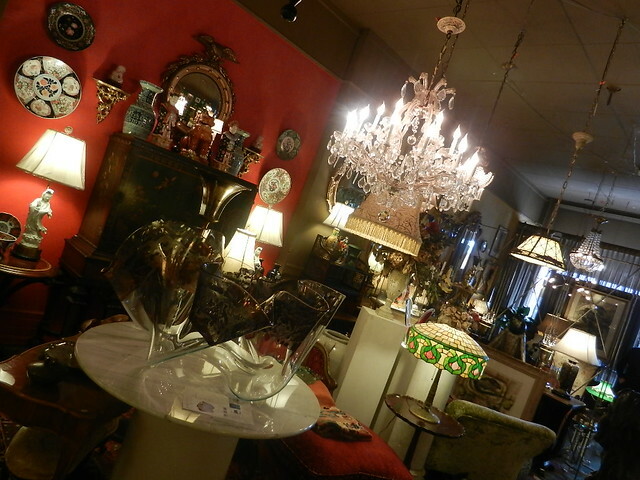 I love antique furniture; there was an amazing dining room table and chairs that I had to get a closer look at. 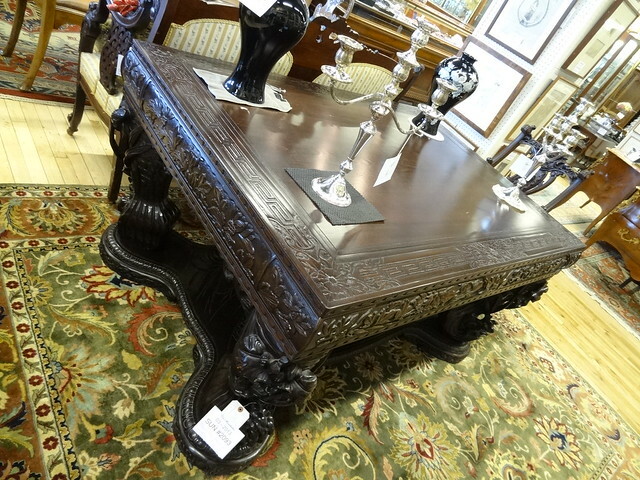 The table was dark wood, thick legs are lavishly carved, two candelabra’s rest on top. Glass counters are filled with a bevy of vintage jewelry. 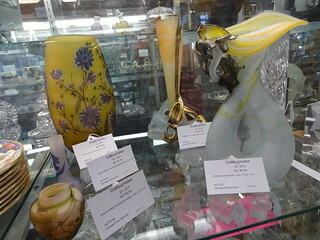 Each item bears a tag with a description, when the item goes up for auction and how much it is expected to sell for; many of the estimated prices surprised me, some higher, some lower than I would have thought. We descended the stairs back to ground level; a pair of lights look as if they once called a theater home, many large pieces are displayed here. 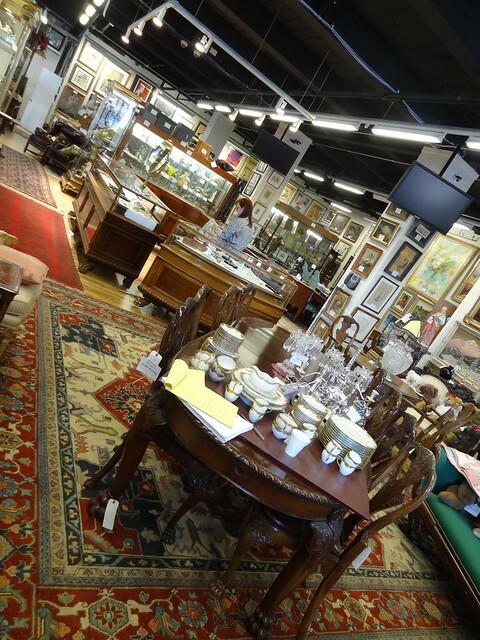 All items that will be sold at the next auction are on display for potential bidders to see and touch before the bidding begins. 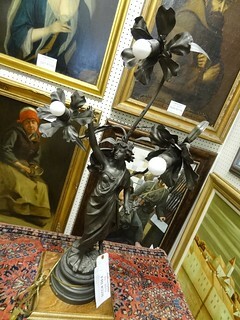 Next time we come it will be to watch a live auction; I can’t wait. It is such a beautiful day and Detroit has a spectacular riverfront, the thought of outdoor dining comes to mind; a gust of wind blows, reminding us that is still a couple of months away, we have the perfect compromise: lunch at Volt. The Renaissance Center is often described as a “city within a city”, I’d have to say that’s an accurate description; its seven towers and 5 million square feet can be a bit overwhelming. Today we are just concentrating on the central tower; home to the Detroit Marriott, this is the tallest all-hotel skyscraper in the western hemisphere, not to mention the tallest building in Michigan. 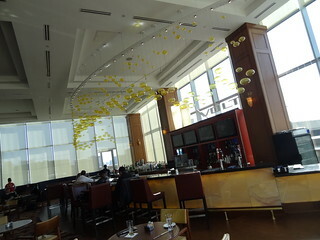 Volt is the Marriot’s lobby bar and restaurant, with floor to ceiling windows it offers a wonderful view along with contemporary dining. We placed our order and took in the bright and airy room while we waited for our food; translucent amber-colored glass bubbles dangle above the semi-circular bar, the carpet pattern is done in rich shades of red, purple, sapphire and gold, as are the accent colors of the room. 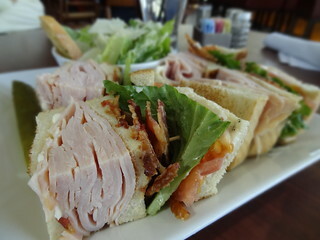 Our lunch arrives; a Roast Turkey BLT served with a mini Caesar salad and Artichoke Dip with house made tortilla chips, everything was tasty! In the summer you can dine on the patio with an unobstructed view, now that’s something to keep in mind when the warm weather finally arrives. Before we left we took a walk around the tower, enjoying more water views and thinking there’s still more to explore…..next time. It seems as though Detroit is always in the news for one awful thing after another; newspapers and newsrooms seem to take pleasure in the decline and despair of a city with a lion’s share of problems. Allow us to tell you about the good. 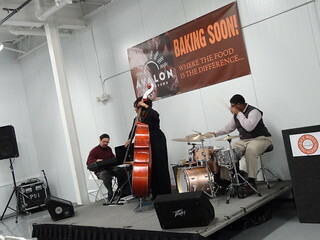 Avalon International Breads has been providing Detroit with wonderful products and positive stories for years, and they’re doing it again! Due to the bakery’s growing presence in restaurants, cafes, grocery stores and retail outlets they recently purchased a 50,000 sq ft building on Bellevue in Detroit that will serve as the center for production. 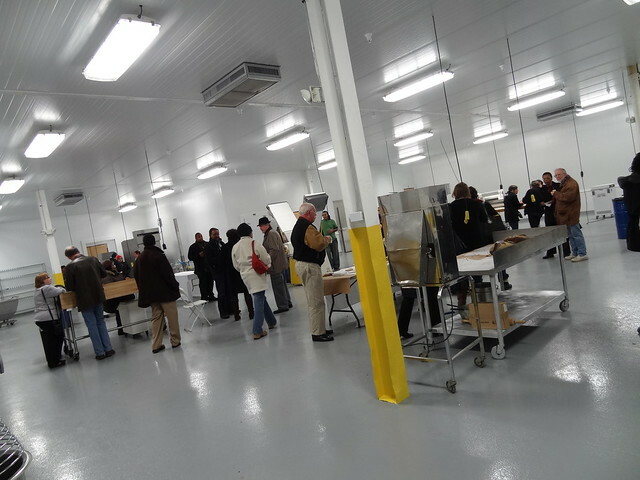 This new branch of the business, City Ovens, recently held an open house to show off their new space and is it ever impressive! A former manufacturing facility, it has been turned into a pristine work space that is expected to double its current workforce. We enter the building in the area that will eventually be a small retail outlet for baked goods, we are welcomed by employees and volunteers, they point the way to food, drinks, and tours. 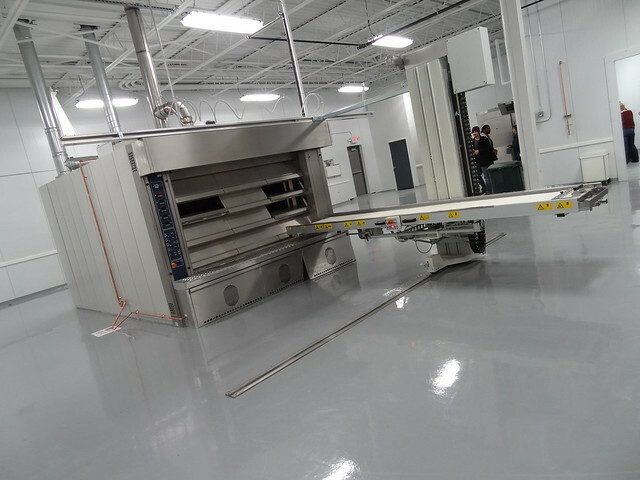 Each area is white from top to bottom, equipment shines in stainless steel, we pause at a table with an amazing spread of fresh-baked bread, fruit, veggies and dips. Visitors are huddled in small groups eating from paper plates, I see chocolate cake in the distance and waste no time snatching up a piece for us. We pass into the next room where the Marion Hayden Trio plays on a small platform stage, a huge oven is front and center in the room, it is so large I could stand up inside of it. Several feet away a cooler waits to be filled with all the tasty items that will go into Avalon’s goodies. 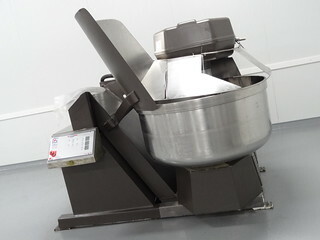 In another space enormous stand mixers rest on the floor; whisks and dough hooks are as big as my head, I have to wonder how many people it takes to lift the bowl.There is such a positive vibe going on, good bread, cookies and chocolate cake seem to have that effect on people….But it’s more than that, Avalon was the dream of two women who wanted to feed Detroiters’ good quality products that are incredibly delicious. The bakery has become a neighborhood staple, a place where people stop in for a loaf of Scallion Dill, a Sea Salt Chocolate Chip Cookie and a good cup of coffee; they provide sustenance for the body and the soul, and employment to boot; now that’s a success story! Bad news is easy to find, you may have to dig a little deeper for the positive; but believe me, it’s out there! 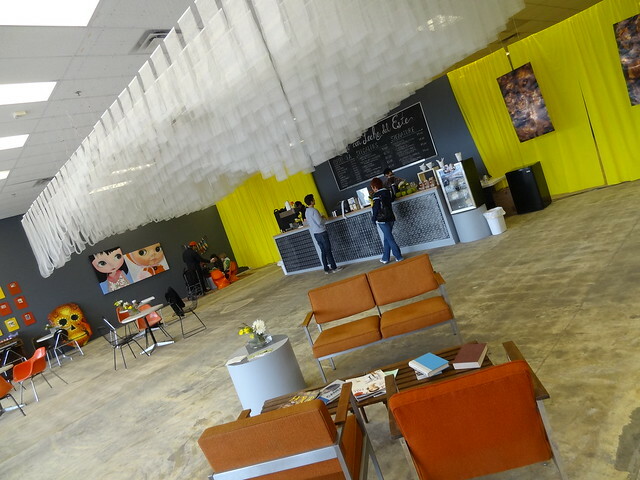 Things are moving quickly in Detroit these days; Pop-up businesses are popping up all over. Temporary shops open in a building or space that has been vacant or forgotten; the lease is short-term anywhere from a day to a month; restaurants, bakeries and retail all give it a go. Today we are checking out Cafe Con Leche del Este in the Lafayette Park neighborhood. 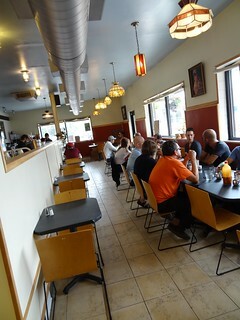 Being regular patrons of Cafe con Leche in southwest Detroit, we were anxious to see what Jordi’s new space had to offer. We are big fans of the architecture of the neighborhood; designed by Mies van der Rohe in the early 1960’s, it was an urban renewal project consisting of townhouses, highrises and a shopping center adjacent to a 19 acre public park. Some storefronts in the shopping center have been vacant for years; densely populated, area residents have been longing for a local coffee shop where they could grab their morning cup of joe, or hang out with friends over a cubano. 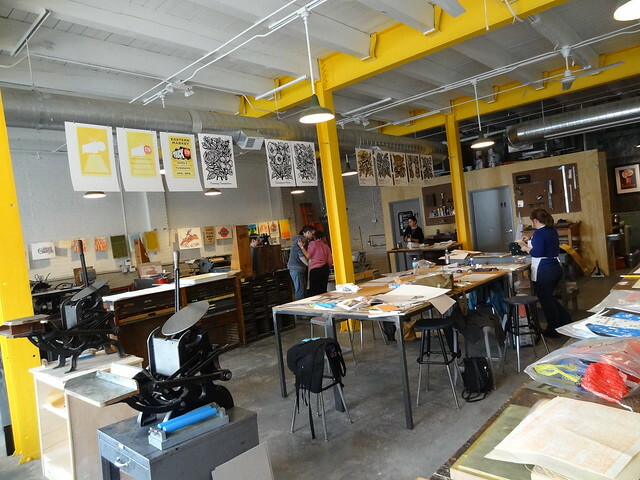 The project came together with a combined effort from the community; the furniture was donated by neighbors and friends, the bold yellow curtain dividing the space was made by the local knitting club, someone even loaned the large fluorescent MIES sign that hangs in the front window. The space is fabulous; the front wall, all glass. 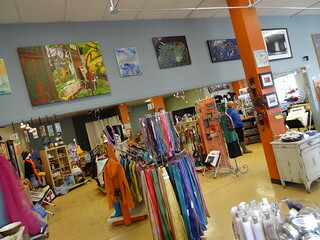 Inside the walls are painted charcoal grey, bursts of color in orange and yellow bring the place to life. The coffee menu has something for everyone from a basic pour-over to specialty drinks. We ordered at the counter and then took a look around. 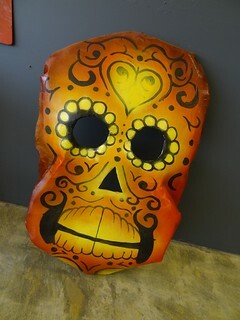 The furniture is ultra cool modern, the artwork Spanish-influenced, the coffee, delicious! Kris was feeling daring so he chose La Lumbre del Diablo (the devil’s fire), made with espresso, Habanero, cinnamon, honey and milk it is excellent, not too much heat, and an excellent combination of flavors. I had the Don Bigote, espresso, chipolte, chocolate and milk, I can’t wait to have another! The shop is only here till December 8th, so stop by soon. In the mood to do a little browsing, we drove north and landed in Eastern Market. 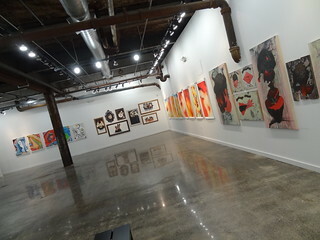 Our first stop was Red Bull House of Art on Winder street, we were there for the Detroit Design Fest, but wanted to have another look without the crowds. 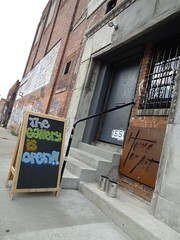 A chalkboard on the sidewalk informs us the gallery is open, a low metal sign introduces us to the House of Art, the windowless steel door is imposing. 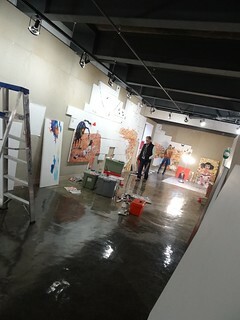 Inside, the main floor is studio space for the next eight artists who will be featured in the upcoming exhibit. We walk around the studios, turpentine scents the air. The work of each artist is vastly different, incomplete pieces are intriguing. We descend the stairs to the gallery, the artwork a stark contrast to the bright white walls. I remember many of the pieces, others I am seeing for the first time; panels featuring the name and background of each artist hang on the wall, benches encourage you to sit and ponder. We took one more look around before heading out, looking forward to the next exhibit. Over on the service drive of the Fisher Freeway is a collective of arts designers and musicians called Michigan-Artisans. You may recognize the building, it was the home of Germack for many, many years before they moved to Russell St. 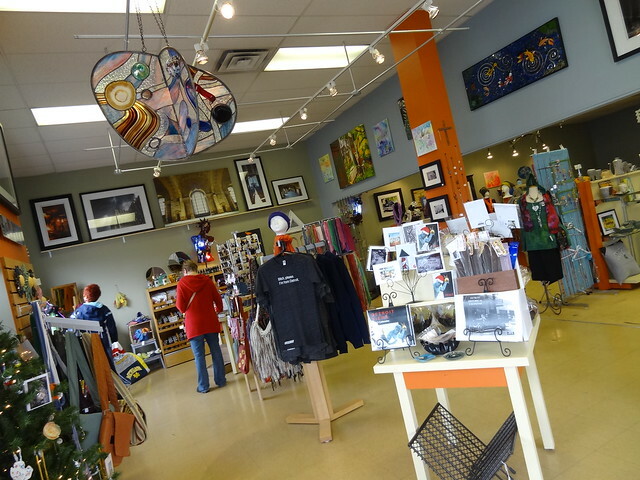 The gallery features high quality products from Michigan artists; photography, jewelry, clothing, glass, you name it, music too. 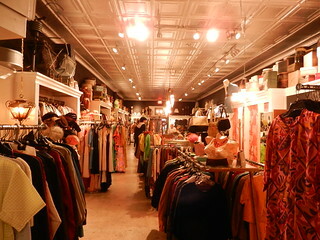 The boutique was busy with shoppers, though I hate to admit it, the holidays will be here before we know it. 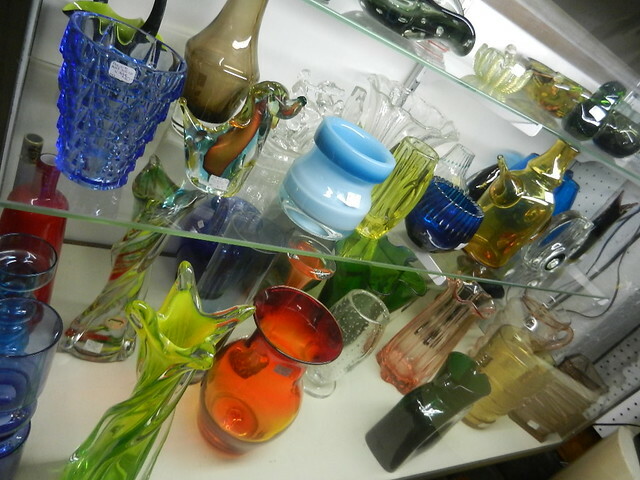 The selection of items is huge, prices are good and range from a few dollars to a few hundred. 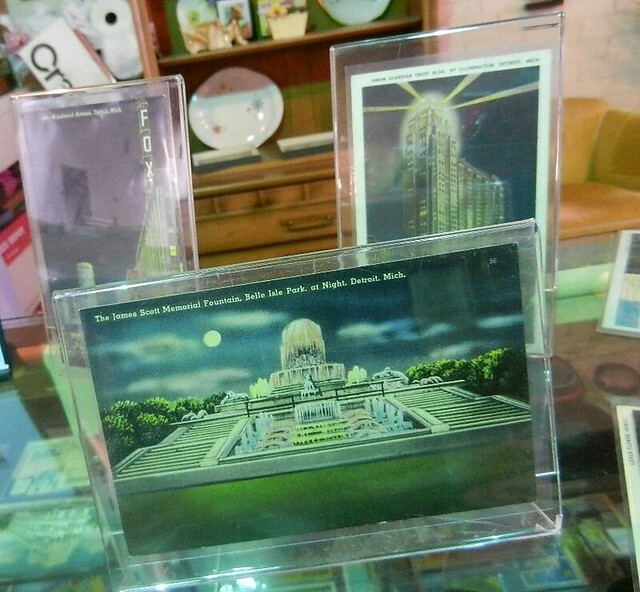 Displays are eye-pleasing and draw you from one to the other. 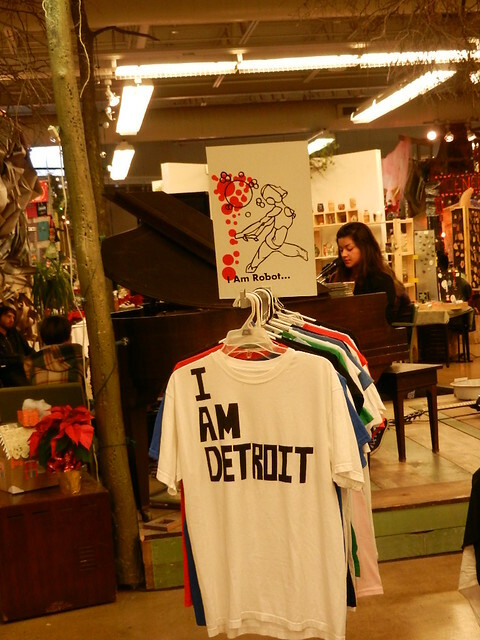 Many objects feature the mitten state; bags and purses are decorated with the upper and lower peninsulas, T-shirts feature local sayings, the Detroit skyline graces multiple pieces. Deeper into the market district is Signal-Return Press on Division Street, make it a point to stop in. 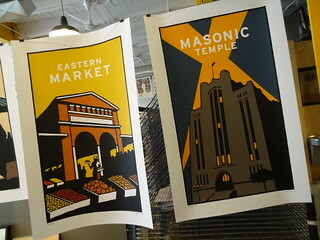 The store is a combination retail store and workshop featuring traditional (old-fashioned) forms of printing. We used to come to this building when it was the Johanson-Charles Gallery, it has undergone an extensive renovation leaving the space bright and airy; structural beams are a sunny yellow, giving the white ceiling and walls a warm glow. House printed posters hang everywhere, they are gorgeous, there is no mistaking this for some laser-printed image. Antique-looking hand-crank presses rest in the open workshop area, we ask permission to get a closer look, they remind us of something we have seen in Greenfield Village or other historical museums. Yet, here they are rolling out beautiful modern images created with letterpress and typesetting techniques, all done by young people! 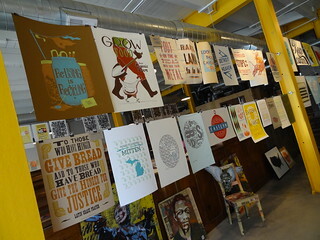 Posters and cards are for sale, or take a workshop and make your own. We seem to be meandering from district to district, we find ourselves in Greektown with growling stomachs. We heard a new restaurant was opening; we’re in luck, a front row parking space and an open sign. Somehow, over the years, Greek restaurants have become the minority in what was once an entirely Grecian area, Santorini is bringing Greece back in a beautiful way. 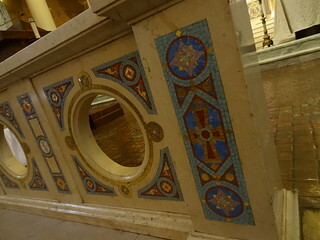 The former Mosiac has undergone a complete make-over; a pair of statues flank the entrance, once inside we find ourselves on what appears to be the deck of a yacht. The floors are polished hardwood, brick walls are white-washed, scenes straight out of Santorini make us feel we are sailing past enchanted villages on the island, it’s so pretty. 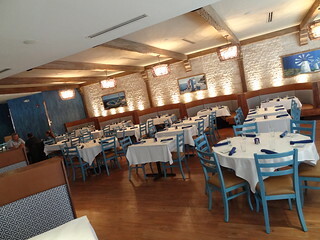 The menu stretches from traditional to more daring Greek dishes, if you can’t pronounce it, just point. We went the appetizer route and ordered several dishes; yes, we had the flaming cheese, and you know what? It was excellent. In fact, everything we had was, from the bread to the vegetarian grape leaves. 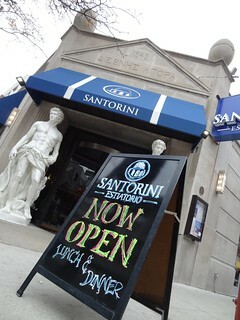 It’s good to see some Greek back in Greektown. It was a lovely Sunday morning; today we decided to get down to Most Holy Redeemer in Southwest Detroit and take some pictures of this magnificent church. When we arrived mass was still in progress, we’d have to come back; no problem, there is always something to do on West Vernor. Luna’s Bakery rests in the shadows of the Most Holy Redeemer complex, we knew if we wanted to shop at the bakery it would be best to stop in before mass let out. 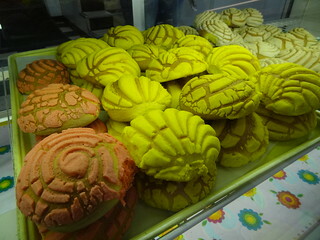 We stepped inside to the delightful aroma of freshly baked sweet bread or conchas as they are called in Mexico. Glass showcases line the right wall and continue across the narrow back. Like most of the bakeries in the area it is self-serve; grab yourself a tray and a pair of tongs and go crazy. We peered into each case as we walked across the back, how does one decide? Cookies come in bright pink and yellow, some are sugar-coated while others are studded with nuts, jam or chocolate chips. We picked a few different ones then arrived at the cake section; Luna’s makes an awesome Carrot Cake, had to buy a slice of that. Conchas are a must; topped with pink, yellow or cream-colored sugar, these sweet rolls are wonderful with a cup of coffee in the morning, or in the evening, heck, they’re good anytime! We grabbed a few of those too; on the urging of the owner we tried another pastry with a pumpkin filling, delicious. With enough baked goods for a large family we were off to see the church. Before we take you inside, I’d like to tell you a few things about this place. 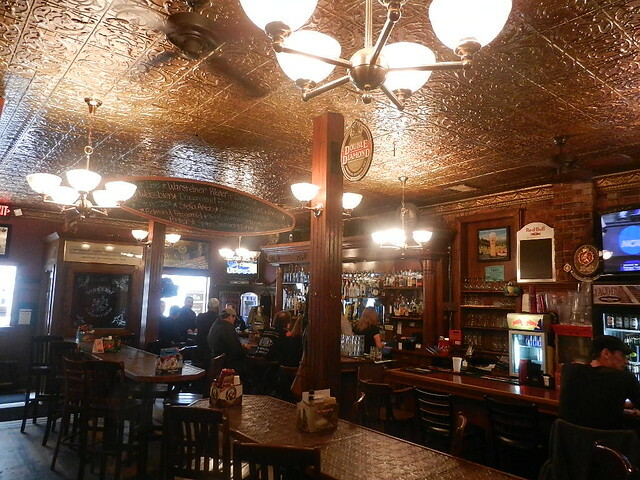 Situated on the corner of Junction and West Vernor, it has graced this community since 1921. The building is huge! 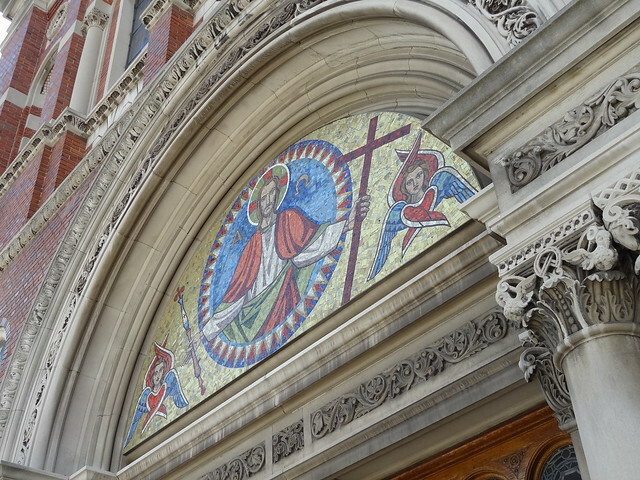 A red brick basilica style church, it is adorned with intricately carved stone, beautiful mosaics, striking wood entry doors, murals and a Pewabic tile floor that, according to Pewabic’s records, cost $12,560.65 when it was installed. This church was important to the community, it served the neighborhood in many ways; it even had its own schools. At one time Most Holy Redeemer was the largest Catholic parish in North America; it is said that it once was the largest English-speaking parish in the world. 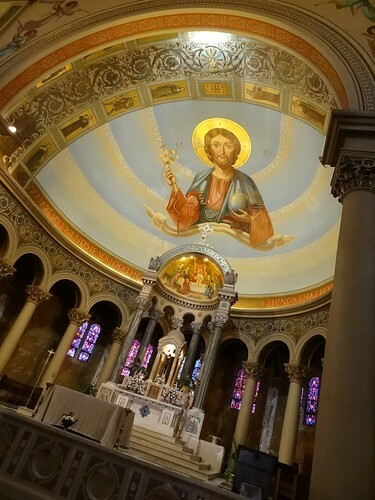 On Sunday the church offered 15 masses to accommodate all who worshiped there and on Tuesdays when the Devotions to our Mother of Perpetual Help were held, special streetcars were added to the city line to get folks to and from MHR. I have read several different articles on the church and while numbers vary a little bit the general consensus puts attendance at 9,000 for Sunday masses and 18,000 who participated in the devotions, WOW! The church has also been featured in the spotlight; it served as a major fixture in the movie “The Rosery Murders” starring Donald Sutherland. More recently, MHR made a cameo appearance in the White Stripes video “Hotel Yorba”, how cool! Ok, now we can go inside. 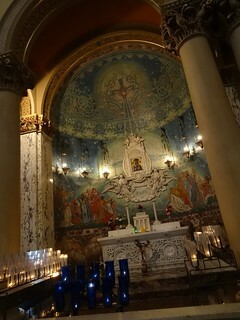 We enter the church as the last of the worshipers straggle toward the exit; beauty is everywhere. The priest stands in the main aisle way talking to a parishioner, he smiles at me and waves, I wave back and nod my head to thank him for the opportunity to wander through. Kris cannot decide where to start taking pictures; the obvious draw is the altar. Marble steps lead you upward,the back wall is amazingly tall, at the top a half dome where Jesus is looking out over us; right above the altar is a smaller half dome painted with a mural. The windows behind the altar are most unusual in color; pinks, purples, indigo and blue are quite pleasing to the eye, I read somewhere that these are the work of a Detroit artist by the name of A.K. Herbert. There are many spectacular stained glass windows throughout the building done by different artists, but I found these particularly attractive. On each adjacent wall you will find side altars; each mimics the same half dome, one is covered in gold leaf and pays tribute to Mary, while the other side features enchanting Angels. 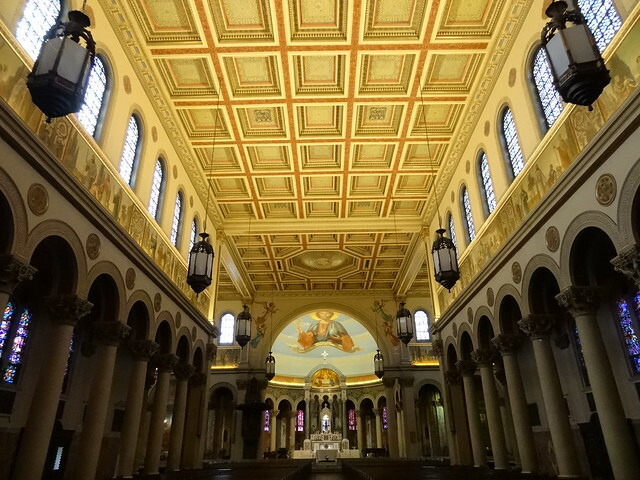 Whether you are standing in the front of the church or the back the nave is quite impressive; the stunning coffered ceiling rises three stories, lantern style lights hang from delicate chains, stone archways line each side, every inch of space is decorated. We walk around with our head tipping upwards, hoping not to trip. 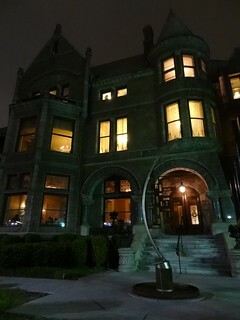 We go out through a side door, the exterior is lavished in artistic details; light fixtures and windows are ornate. 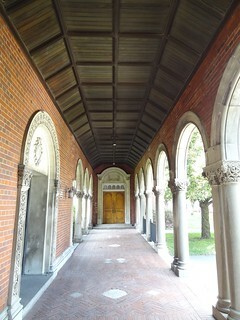 A portico runs parallel to Junction; more stone columns and a brick walkway, I feel as if I am somewhere else. The atmosphere both inside and out is serene. 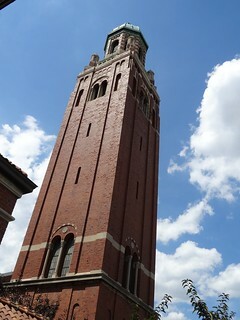 A stone bell tower was built years after the church, in remembrance to parishioners lost in the war. It reaches way up toward the sky; I stare at it until I can no longer take the glare of the sun in my eyes, Kris keeps moving further back to try to capture the full image. We take one last look inside before we leave. On the steps outside church-goers are saying their goodbyes, the bicycle vendors have run out of customers for now and move on, children in Sunday clothes run around on the sidewalk as their parents try to corral them. It’s wonderful to see the continuation of the land standing ritual of Sunday Mass. 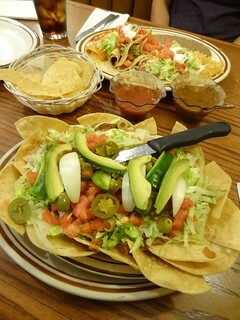 For us lunchtime had arrived; we drove deeper into Southwest on Vernor until we reached El Rancho Mexican Restaurant. There are so many places to eat in this district, we try to alternate between our favorites and places we’ve never been. Located on a corner, the building resembles a large home; the front is brick with wrought iron embellishments, the side a lovely painted mural of Mexico. 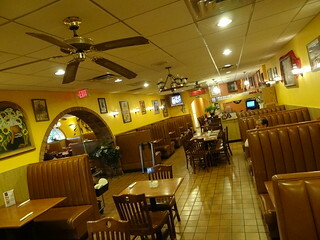 We went inside to the dining room; golden-yellow walls and brown vinyl booths give the space a warm feeling. We were greeted immediately; with a quick look at the menu we placed our order. 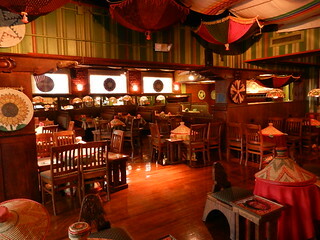 We always go with some sort of combination when trying a new place, that way we can find out what we like best. Our chips and salsa arrived super fast, and before long our food. We had a botana, and a combo plate of a hard shell taco, tostada, enchilada, flauta and of course rice and beans. While not a flavorful as some of our favorites, still a good meal for a good price. 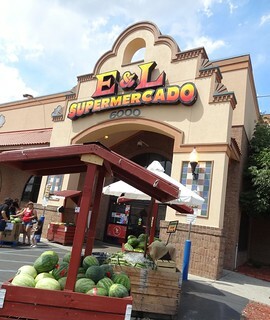 I needed to pick up a few things for home, so we walked across the street from the restaurant to E&L Supermercado. Whether you need something or not, a trip to the mercado is always fun. Near the entry wooden crates are filled with summer favorites; whole watermelons, corn on the cob and cantaloupe. 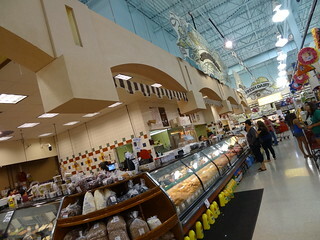 Inside, the store is bustling with shoppers; carts are filled with traditional Mexican foods. We roam from aisle to aisle admiring all the colorful packaging. 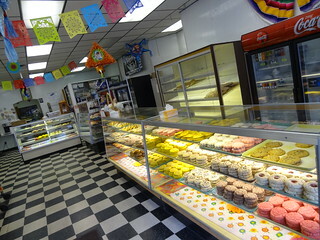 The fresh meat counter offers a large selection of fillings for tacos, enchiladas and burritos. The dairy department is a paradise for a cheese lover like me, so many new things to try. 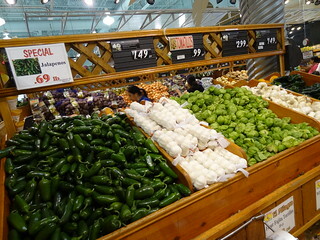 In addition to the standard items, the produce department has piles of tomatillos, poblanos and jalapenos; not to mention things like coconuts, yuca, yame and yuatia. I was looking for simple flour tortillas; I had about 15 to choose from! 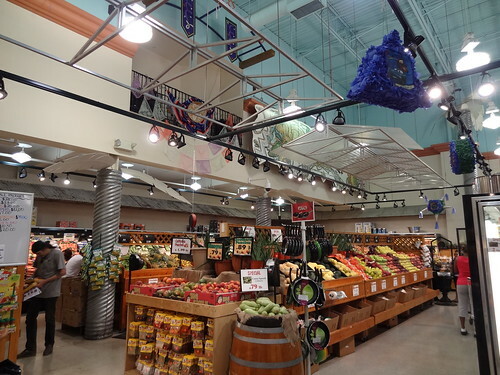 The store is bright and airy; the ceiling painted light blue to mimic the sky, mock palm trees and cheerful looking pinatas decorate the market. We reached the last aisle; I had gotten everything on my list, and then some! 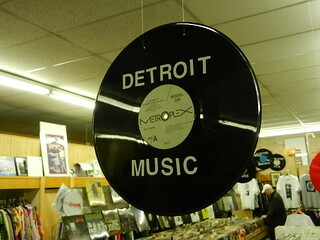 DETROIT: Something Old Is Something New…. It was a gorgeous Saturday in August, it had been too long since we’d been to Eastern Market; consistently a bevy of activity, there is always something new to see. 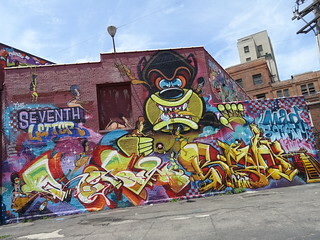 As we approached from Gratiot we were greeted by vibrant, amazing new graffiti; time to stop and get some pics. While we were warmed up, why not take a stroll and see what else we can find… The artwork is fabulous, cool, clever and comical; I love the bright colors and attention to detail. 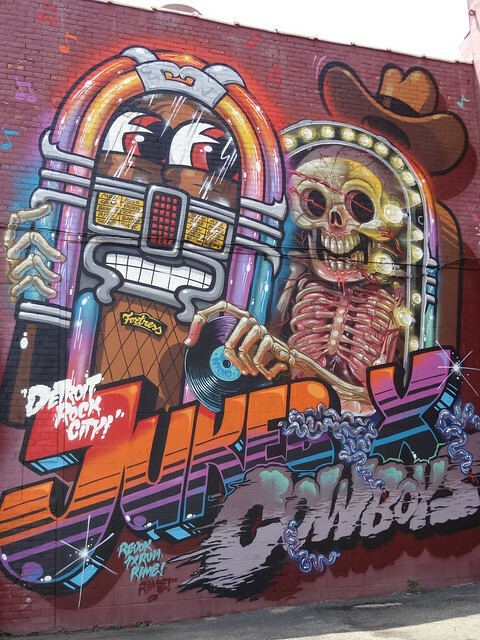 The Detroit Beautification Project brings in artists from around the world; word is Flying Fortress and Nychos are responsible for these beauties. 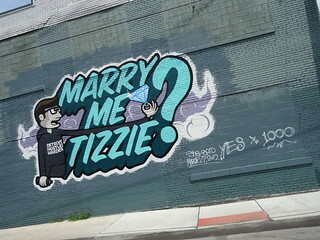 There’s even a marriage proposal to Tizzie from Tommy; looks like she said yes (x 1000) !! 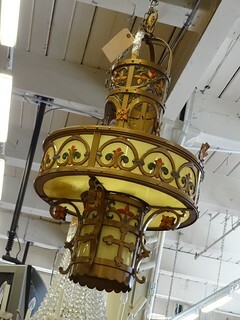 We hadn’t been to DeVries & Co (formerly R Hirt) since the ownership change within the family. This three-story building has been standing on Market Street since 1893, I have to say it has never looked better; front windows have been opened up, the inside spruced up. Gone is the clutter; shelves are well-organized, lighting is bright, aisles easy to walk through, the traditionally long line for cheese remains. 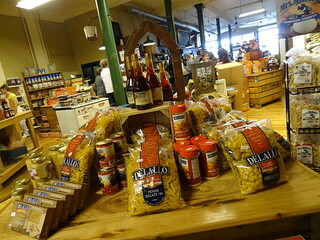 You can purchase oatmeal from Ireland and pasta from Italy, vinegar, sauces, cutting boards, spatulas, you name it. Browsing the main floor I was happy to discover a Michigan products section; Faygo, McClures, BetterMade, and an unexpected surprise: Great Lakes Tea and Spice. The shop has always been known as a retail cheese store; the extensive variety attracting shoppers from all over. We stood and watched as connoisseurs made their selections, tasting each before deciding which to take home. Next time I need to bring a cooler so I too can partake in the fun. 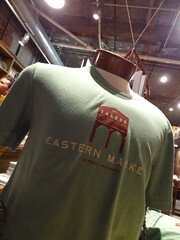 A couple of doors down is the Eastern Market Seafood Co; walk in the door, the aroma of cooked sausage permeates the air. Benches sit front and center; hungry shoppers sit elbow to elbow noshing on 3 sausage pita sandwiches. Don’t be confused by the large number of folks consuming the infamous Old World Sandwich. 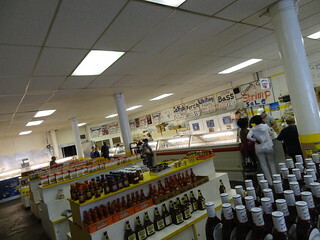 Yep, this is a seafood place that is known as much for its sausage as its seafood. 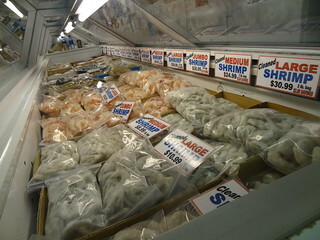 Cold cases run down one length of the store and across the back; they contain a wide variety of fresh and frozen seafood. 3 lb bags of frozen shrimp in an array of sizes, crab legs, and lobster are offered at low prices, salmon fillets and whole trout are packed on ice. Packages of dried pasta, BBQ sauce, large containers of oil and hot sauce are also available. Next door you will find the Cost Plus Wine shop. Tall categorized shelves line the walls; reds, whites and rose’s have made their way from Canada, Spain, France and Italy. I like looking at the bottles themselves; labels vary from traditional to clever, as do names. Staff members are helpful, friendly and knowledgeable; tell them what you like and they will choose the perfect bottle for you. Prices are reasonable, below retail I’m guessing. Beer drinkers have their own special area near the front window; ales, wheats, lagers and stouts both local and imported. Bottles come in six packs or larger individual sizes. Planning a special dinner? You could stop in at DeVries for some amazing cheese, pick up a couple of lobster tails at the seafood shop, then add a wonderful bottle of wine. You can even add a nice bunch of grapes or fresh strawberries and how about a crusty baguette from Avalon, all available right there in the market.Speaking of the market, we walked back up the street to take a walk through ourselves; we passed an artist displaying colorful paintings, a selection of Detroit themed T-shirts and a live statue who was silver from head to toe. I love coming here, you never know what you’re gonna see, but you can be assured it’s gonna be good! 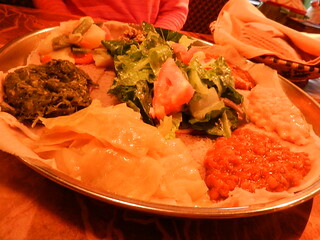 Looking at food always makes me hungry, besides, it was time for lunch. 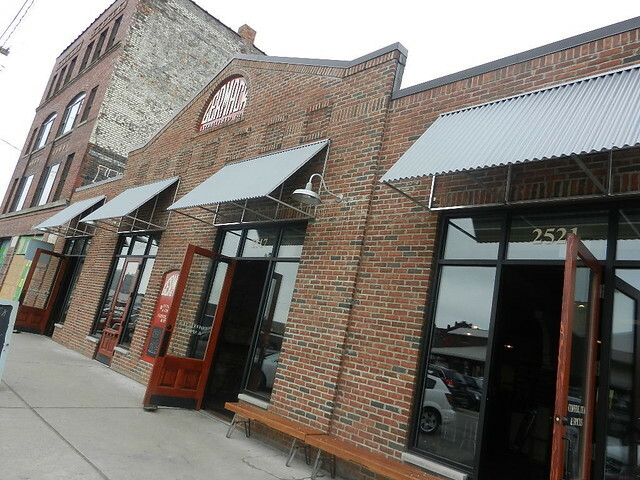 Back in late spring The Brooklyn Street Local opened on Michigan Ave in Corktown. This breakfast and lunch only diner uses local, organic ingredients and whole foods. The owners are two Toronto residents who decided to open a restaurant in Detroit and introduce us to poutine. 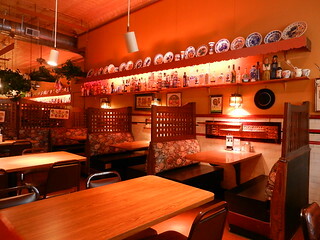 The decor is simple; tile floor, black tables, wooden chairs and diner style lighting. The menu is typical breakfast and lunch fare: eggs, Quiche, pancakes, soup, sandwiches and burgers; the preparation is special. Items are house made whenever possible, high quality ingredients are always used. 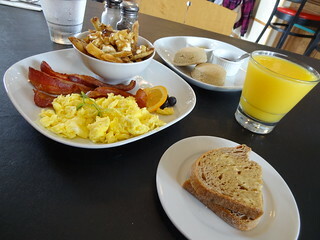 We went for the scrambled eggs, bacon, wheat toast and of course, the poutine. What is poutine you ask? A large serving of french fries are placed in a bowl, covered in gravy and topped off with cheese curds….. seriously, It’s good! We also had the scones, served with a side of jam and lemon curd they were delicious. The restaurant is becoming popular, I can see why. Our last stop for the day was a little out of the ordinary; a new novelty coffee-house in mid-town called Chou Anime. It’s kind of hard to describe, but I’ll give it a go. Now keep an open mind as you read and think fun. The cafe is modeled after the “maid cafes” that operate in Japan, sort of a silly modern twist on geisha. There are bunches of people who are into Japanese Manga (Manga are comic books) and anime (cartoons based on manga) and know all of the characters. 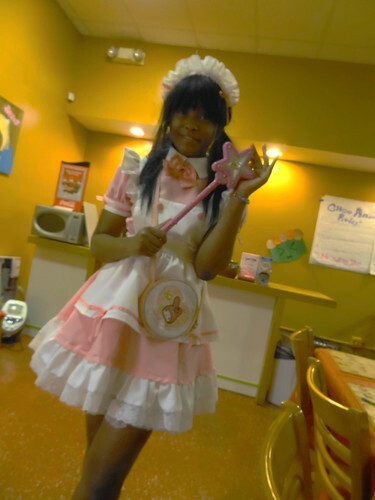 At such cafes you have maids (instead of ‘waitresses’); they dress in cutesy costumes with aprons, ruffles and bows, maybe a magic wand, and go by character names. Your maid will address you as ‘master’ or ‘my princess’; she will take your order, serve your food and beverages, and for a small fee ($2.00) she will sit at your table and play board games, cards or video games with you, really! The girls (oops, maids) are sweet, and seem to be having a great time. Tables are long and meant to be shared, there is a limited but decent menu; salads, sushi, wraps and instant udon, along with tea and Great Lakes Coffee, they even have desserts. So there we sat, taking it all in, fellow patrons having a bite to eat and enjoying the experience, some drink sugary concoctions out of bottles with a silver ball in the opening (much like my hamsters water bottle), and promising to come back soon. 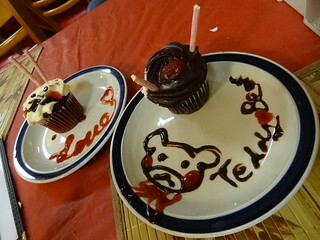 Our cupcakes arrived; one chocolate, one red velvet, both sporting strawberry pocky protruding from the top. Cakes were moist, excellent frosting piled high; our maid had decorated the plates with pictures and greetings using flavored syrups, all very cute. The retail part of the shop sells Hello Kitty items, Japanese imports, including pocky, and a selection of maid costumes, kimonos and anime posters. Walls are painted and decorated cheerful characters such as smiling cupcakes and happy cake slices. The whole point of the theme is to create a warm, fuzzy, happy feeling. So, if you’re in the mood for a treat that comes with a happy magic spell, you know where to find it! UPDATE: I am sorry to report that as of October 2012 Chou Anime is no longer open. 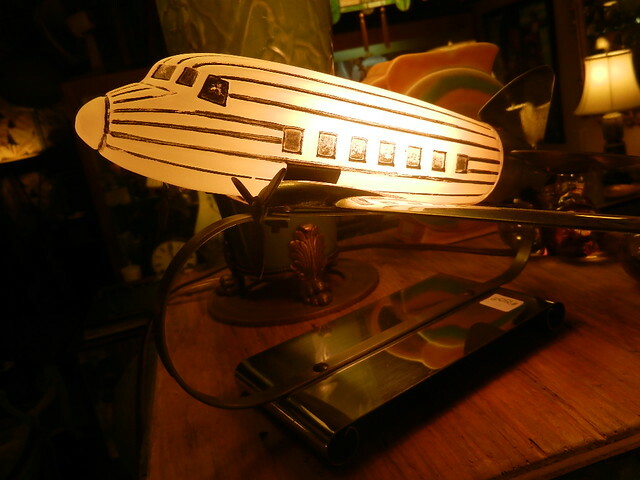 It was one of those lazy Sunday mornings, our only concrete plan was to check out the Royal Oak Flea Market. 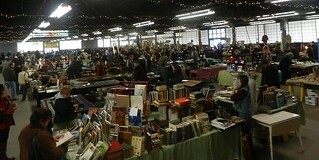 Although the activity starts bright and early (8am), it goes on until 3pm, giving us plenty of time to get there and browse. 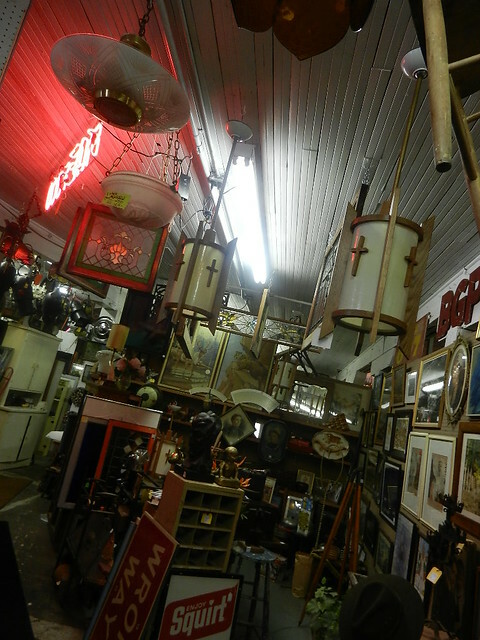 You don’t have to be a collector to enjoy a visit to the flea market; contained in the building is a fascinating array of items both new and old. There are things to wear, books to read, toys that bring back memories. Stuff for your yard, gourmet caramel corn and a coffee stand, and that’s just the tip of the iceberg…..
We parked in the adjacent lot and took a look around at the outdoor items first, often this is where you will find the bigger items such as furniture. Inside a large array of tables await your arrival; set up into rows and aisles each flaunts it’s own unique display. There’s so much to see, it’s hard to know where to start; it’s fun to look around, you never know what you might find. 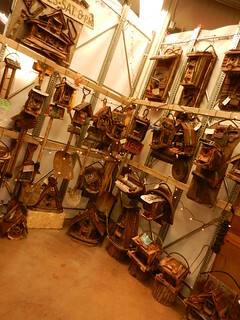 Creative types get clever with discarded items, making them into cool things such as lamps and birdhouses. 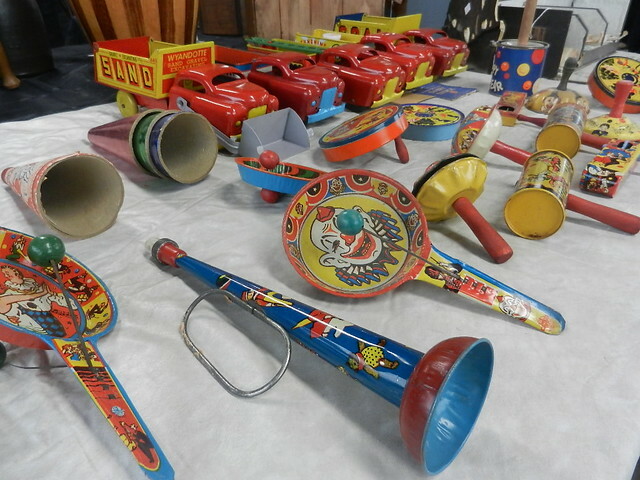 Vintage toys are painted in primary colors and decorated with clown faces; noisemakers and horns look nearly new, I assume this is because at some point parents couldn’t take the commotion and hid them away. 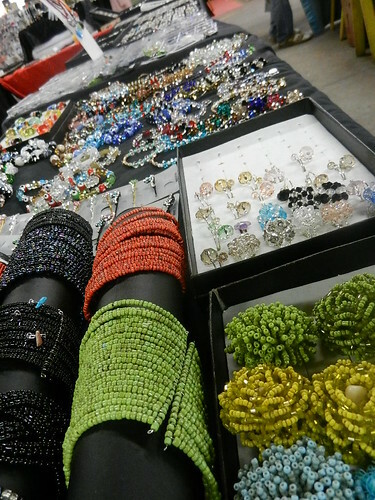 Jewelry abounds; watches, earrings, bracelets and rings; their age spans the decades. 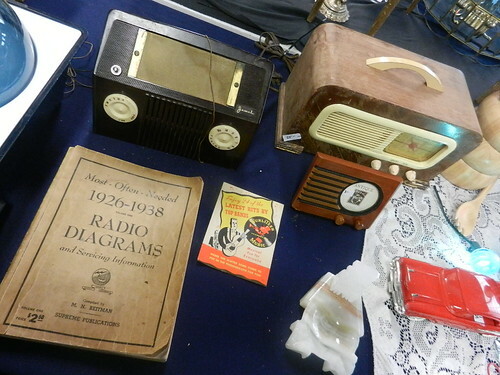 Camera’s, beer steins, record albums and signs, tea cups, sports cards, antique radios and colored glassware, what’s not to like? Each time you go the selection is a little different, but always worth the visit. While Royal Oak certainly has an abundance of restaurants, today I had something different in mind. 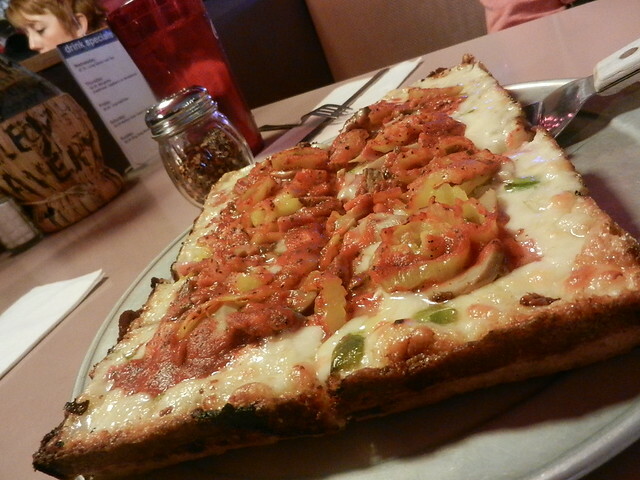 Loui’s Pizza in Hazel Park, located on Dequindre between 9 and 10 mile, is just a short drive from Royal Oak. I grew up on “Detroit” style pizza; it’s square pizza that’s not too thick, and not too thin. The dough is flavorful, the edges are a little dark, and the crust has a distinct crunch, there’s nothing else like it! As you enter the unassuming building you are greeted by framed photos of famous people that have had the pleasure of eating here, there are reviews clipped from newspaper, and artwork done by Loui’s patrons. Step into the dining room and it seems as if you have been transported to a previous decade; the main color of the decor is dark pink…..in a good way…. 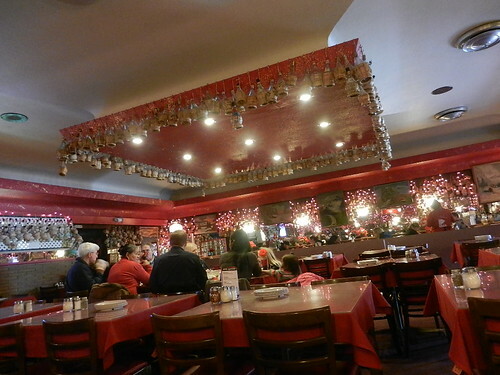 A large square soffit, painted pink and dusted in glitter, hangs from the center of the dining room, dangling from the edges are empty straw-wrapped Chianti bottles. It is a tradition for customers to “autograph” the bottles and leave them to be hung up for display. Booths line the mirror covered walls, pink miniature lights hang in clusters against the mirrors intermixed with more bottles. The main dining area consists of tables that can easily be pulled together to accommodate large groups. Probably the two most popular items are the pizza (of course) and the antipasto salad. The salad is served in large glass bowls; crisp iceberg lettuce is adorned with petite cubes of ham, salami, cheese and slices of tomatoes. Louis Tourtois Sr himself came up with the recipe for the house vinaigrette, tossed right into the salad it’s absolutely delicious! The pizza, well, what more can I add to what I’ve already said? Ours was perfectly cooked, slightly charred on the edges, loaded with delicious toppings, then topped off with a nice coating of tasty red sauce. A small is four pieces, there was none left to take home. Louis Sr, Jr, and the III have been serving up their own unique pizza’s for 35 years, if you’re like me, one taste and you’ll be hooked. If you’ve ever driven north on Mound Road at Chicago you may have noticed Kuhnhenn Brewing Company on the east side of the road. Originally Lutz Harware, the Kuhnhenn family decided to take a chance and turn it into a brewery when a large chain hardware store opened just a half mile away. Bret and Eric Kuhnhenn were no strangers to the brewing process; they had sold home brewing supplies for years out of their hardware store and were home brewers themselves. The space has been transformed into an 8-barrel micro-brewery and brew-on-premise shop and has earned a loyal following. It was my first visit, something I had been looking forward to for some time. 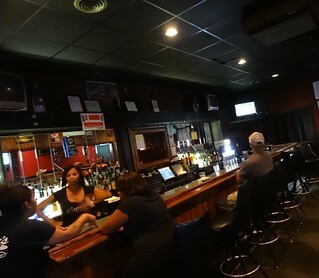 I was surprised the space was so large, the bar takes center stage, high top tables fill the rest of the room. The “menu” is impressive, be sure to click on their link to see for yourself. I had planned on a glass of dark beer, but after the pizza a glass of wine sounded more appealing. I took my time perusing the menu, best known for their German style Hefeweizen, they have a long list of core beers in addition to seasonal brews. 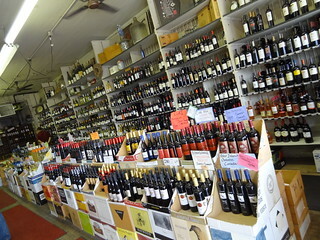 I had no idea they offered such a wide variety of wines; Fruit wines, Red, White and Sweet Wines, something for every taste. On our servers advice I had a glass of the Green Apple Riesling, it was excellent! Light and fresh tasting, with a hint of green apple, just what I was looking for. Kris went with the Creme Brulee Java Stout, WOW! is that good, next time I’ll get that. Pizza, cheese plates and Dan’s Sausage are also available. 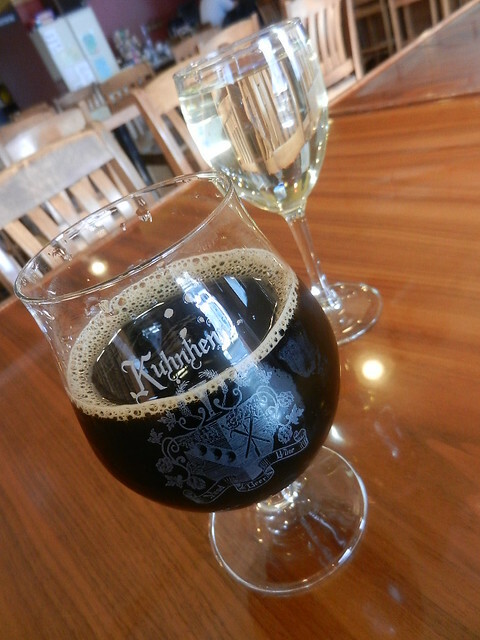 Kuhnhenn’s is a great place to hang out with a group of friends and enjoy some really wonderful beverages. Thanksgiving had passed, to get in the holiday shopping mode we took a drive over to downtown Ferndale. 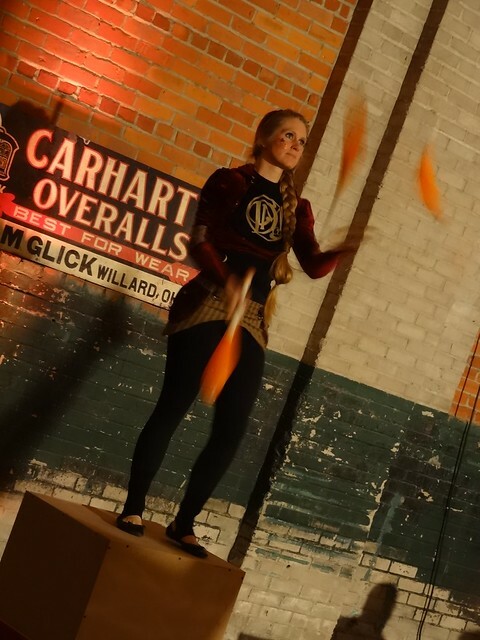 Located off the Woodward corridor this hip, urban city has a little bit of everything. 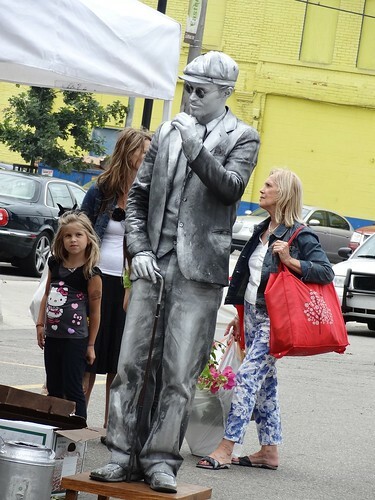 Earlier in the year The Rust Belt Market took over the space formerly occupied by the Old Navy Outlet, we have been curious to see what it is all about, so it was our first stop. It was pouring rain, like every other car driving around we were hoping for a close parking place, we found one not too far from the entrance. We noticed many other people heading to the Belt and wondered if there was something special going on inside. Pass through the entrance and you immediately know that yes, there is something special going on. A young couple took this large, mundane retail space and have worked a little magic. Completely unrecognizable as it’s former chain retail self, the interior has been transformed into a year round home for artists and entrepreneurs. A platform sits near the center and is a stage for musicians who perform each weekend. When we arrived a young woman with a lovely voice sat at the piano and played her songs; the volume was perfect, you could clearly enjoy her performance and still carry on a conversation with vendors. 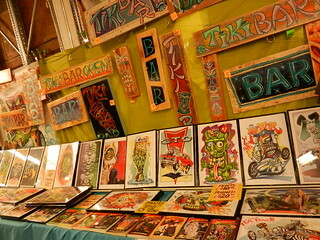 This is no Flea Market or Consignment Shop, there are no cheap or imported goods sold at the Belt. The vendors are hand picked, each vendor or shop, as I like to think of it, is run by the owner; the people who make the product are the same ones selling it. I was completely taken in as soon as I came in the door; the set-up is very appealing, each little shop has it’s own distinct look, the aisles are easy to navigate without being set up in straight rows, the variety is fantastic. 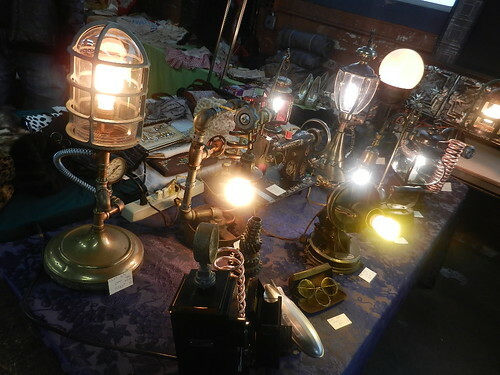 The goods offered are high quality and unique, yes there are vintage items but they are collections sold by people who collect and curate full time. 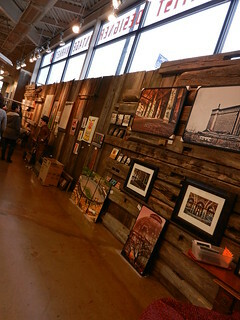 Artists sell stunning paintings and photography, designers of jewelry and clothing show off their talents, one shop sells americana and vintage items unique to Michigan and Detroit; how about a candle made from an old Town Club pop bottle? I saw jewelery made from typewriter keys and old silverware, gorgeous carved clay tiles, handmade soaps and lip balms inspired by classic cocktails, people are so creative! 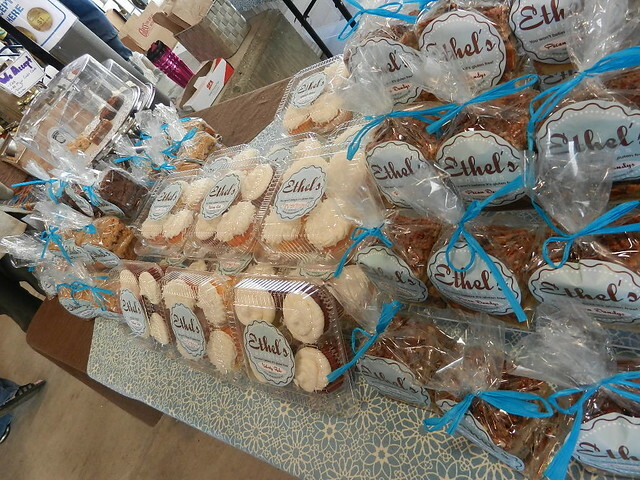 No market is complete without edible offerings, we grabbed some cookies from Butter & Flour & Sugar, oatmeal white chocolate with cranberries, Yum ! The Belt is also home to Henrietta Haus Coffee Roasters, Perkins Pickles, Pete’s chocolate from Hamtramck, and the place that stopped me in my tracks: Rock City Pies…..Yes, I literally stopped and stared at these awe-inspiring pies for about a minute, then of course I took a step closer so I could look some more. Whole pies are displayed in covered glass plates, you can buy them by the slice or take a whole one home. If I remember correctly they had Pecan Bourbon, Salted Caramel Apple, Pumpkin Whiskey, and a Cranberry something, it had a few slices removed revealing extraordinary height and a beautiful cranberry colored filling, how’s a person supposed to choose? We hadn’t had dinner yet, so we forced ourselves to walk away and continue considering our options. 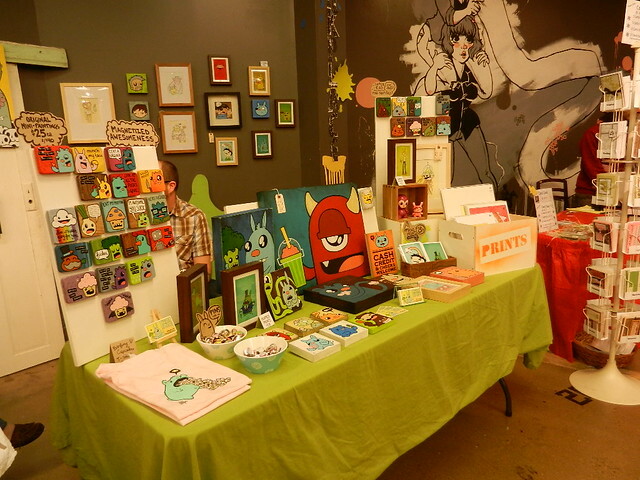 I have to say The Rust Belt Market was a wonderful surprise to me, what a fantastic arrangement; 30 vendors every weekend, live music, amazing edibles and endless gift possibilities. I also appreciate the fact that for every dollar I spend here 100% stays in the local economy. 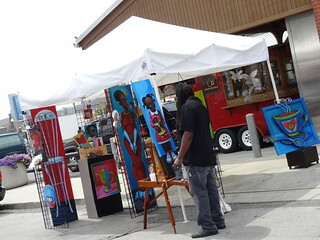 The market is open Saturday and Sunday from 11-7, and an occasional Friday for a special event. I will definitely be back. A little window shopping was in order to try and walk off some of the fullness. 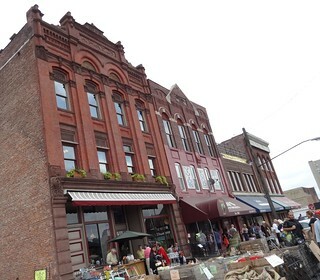 Ferndale has a great mix of unique and independent shops; from apparel and jewelry to health food and home furnishings the shopping is plentiful. There’s a great store called Mother Fletchers, recently having moved a few spaces from their original location, they specialize in vintage clothing and accessories. I love walking up and down the aisles browsing through their well organized selection of goods. After wandering in and out of storefronts we found ourselves back at Rust Belt Market standing in front of, you guessed it, Rock City Pies. As full as we were visions of pie kept taunting us. Lucky for us the market was still open, though there wasn’t even a crumb left of the cranberry, Salted Caramel Apple was still available. We had a piece wrapped to go and made the drive home. Later that evening we indulged in our purchase, scrumptious! The top crust was chewy and almost cookie like, covered with melted caramel and coarse salt, it works perfectly with the sweetness of the thinly sliced apples, this choice was a winner. 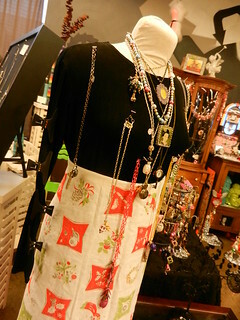 Shopping in Ferndale is fun, come see for yourself! Located within the city of Detroit, is the city of Hamtramck, only 2.1 sq. miles in size, it is Michigan’s most internationally diverse city. 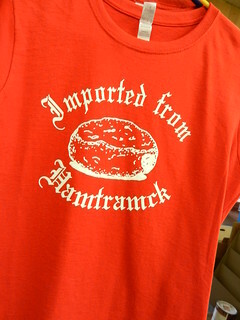 Known mostly for it’s Polish heritage, Hamtramck has many facets. 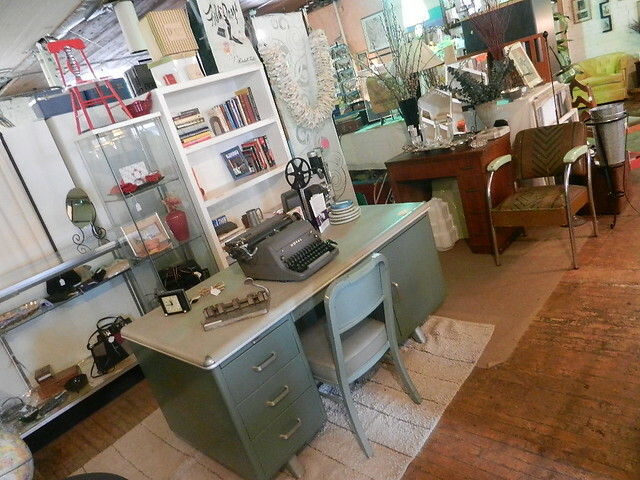 Our plan for today was to check out the vintage shops in town. We parked in the centrally located parking lot behind the shops on the east side Joseph Campau, the mild temperature made it a nice day for walking. There was a great deal of activity down one of the side streets; trucks, cables, and huge lights, a now familiar sight around the Detroit area, which means they are filming. Rumor has it GM is making a commercial for the Volt, which is built at the assembly plant right in Hamtramck. Using the city as a backdrop and featuring local residents, the commercial is supposed to air on Superbowl Sunday. Our first stop was the Record Graveyard on Caniff, dealing exclusively in vintage vinyl records, this is a vinyl collectors nirvana. 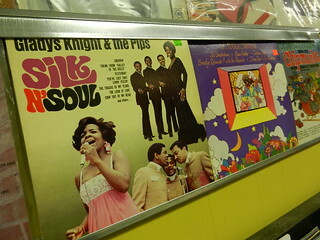 I know nothing about vintage records, yet I find this place fascinating. The album covers immediately grab your attention, with just one look you can usually identify the decade the the album was released. 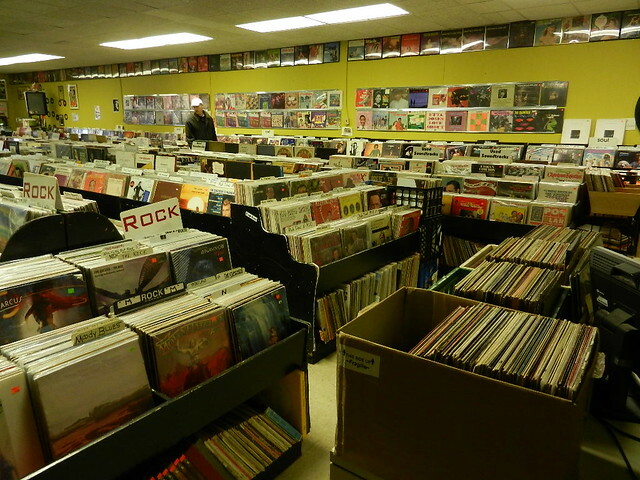 The records are organized by genre; the male vocal selection is dominated by Frank Sinatra, Gene Autry, Country Western section, if you like Jazz, you’ve come to the right place. As I walk around and see names like Glady’s Knight and the Pips songs start playing in my head. (Are you humming Midnight Train to Georgia now?) I recognize the names of artists from my parents generation; Steve and Eydie, Frankie and Annette, Boots Randolph,I even saw Pat Boone. Movie soundtracks are always fun to look through, I find myself saying “Oh yeah, I remember that movie”. Lining the top portion of the walls is a collection of the more risque covers featuring scantily clad women in seductive poses.Back in the day it seems that the cover art was as important as the record inside and is now recognized as such. 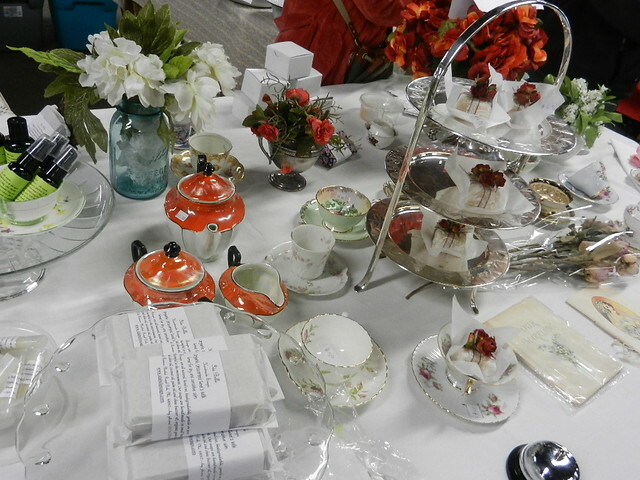 This is a great place to come and browse, you may even find a piece of your past that you want to take home. The building Record Graveyard now occupies is currently for sale, but the owners are committed to staying in Hamtramck, therefore it is a good idea to call before you make the trip! 313-870-9647. 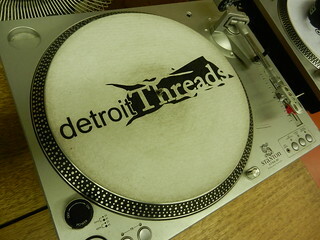 Detroit Threads specializes in vintage items and new clothing by local merchants, along with records, CD’s and DVD’s. 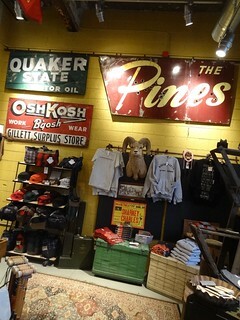 Every inch of the store is packed with merchandise, aisles are narrow and items are displayed floor to ceiling. I like to take my time, there is so much to see I usually have to walk through twice. New t-shirts and hoodies in all sizes and colors feature both Detroit and Hamtramck. 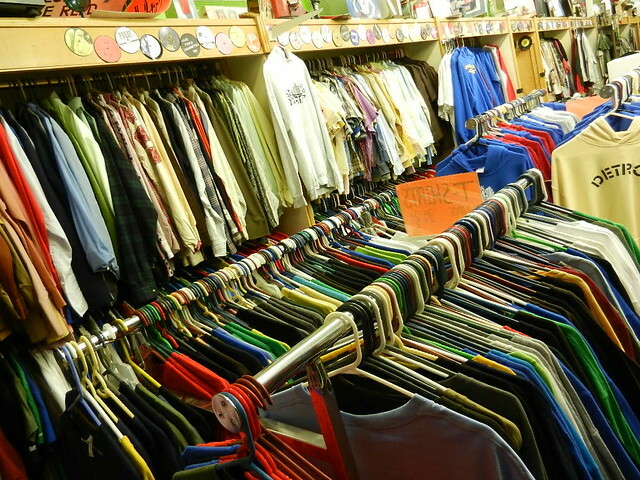 The quantity of used clothing is vast; snazzy sport coats for men in tweed, shark skin and metallic lame, dressy coats for women in leopard print, wool and even fur.They have great accessories for both men and women including hats, shoes, purses and neck ties. 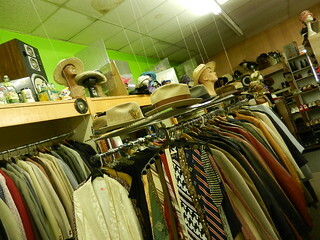 When film crews are in town they often stop in when looking for vintage items. If you look carefully you can find cool items from Detroit icons like Vernor’s , Stroh’s and Kowalski. 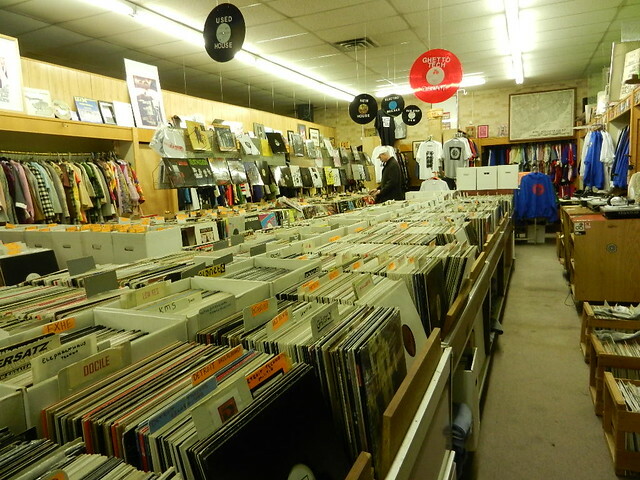 Detroit Threads is also well known for their extensive collection of LP’s, they have it all from local techno to disco and import records, local DJ’s are regular shoppers. They have a little bit of everything and each time you go there’s something new to see. A couple of doors down at 10022 Jos. 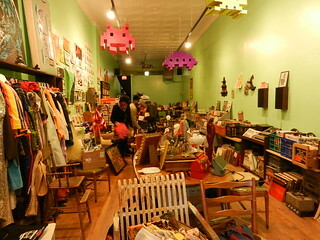 Campau is a shop called Lo and Behold. Only open for a few months now, the selection is quite random; old furniture, records, posters,knick-knacks, books, clothing, kitchen items, even an old saxophone; the plan is to transition more into records and books. 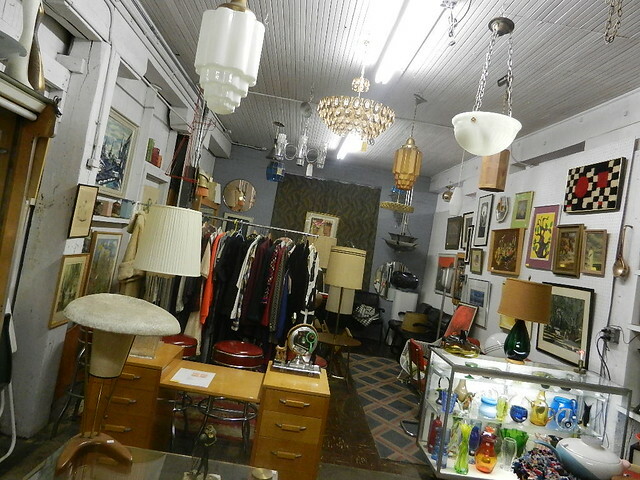 It’s always fun to shop in a store like this because you never know what you’ll find. 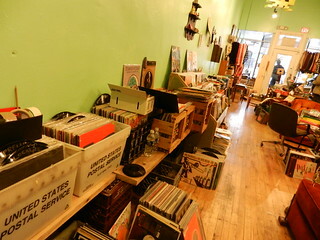 I always like it when there are several resale type shops grouped together, I can park once and browse for hours. Keeping the vintage theme going, we had lunch at Polonia Polish Restaurant on Yemans. Serving up some of Hamtramck’s best Polish and Eastern European food for over 40 years, it has a loyal following. 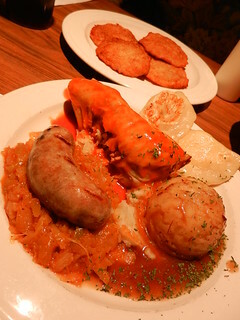 The inside is quaint, a mural depicting life in old Poland covers the back wall, tables and booths line the dining space, authentic Polish dishware is displayed on shelves, Polish music plays in the background. The front of the menu is a Polish Short Dictionary, it includes: Good Day, Please and Thank You, and of course, Kiss Me and I Love You. The phrase is first written in English with the Polish next to it, now if I only knew how to pronounce it……. The combination plate gives you a bit of everything; pierogi, kilebasa, sauerkraut, mashed potatoes, and golabki, it’s so good! My mouth waters just thinking about it. 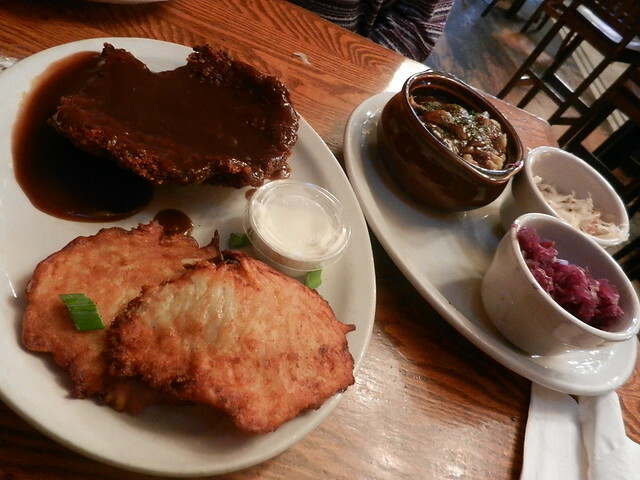 We love potato pancakes so we ordered those too. Fried to a crispy brown outside, tender and moist inside, slathered with sour cream of course, delicious. Back in 2009 Anthony Bourdain filmed a segment here for the Travel Channel and introduced a whole new audience to the restaurant. On our way back home we made one last stop at Bozeks Market on Caniff, not that we needed anything, it’s just fun to look around. 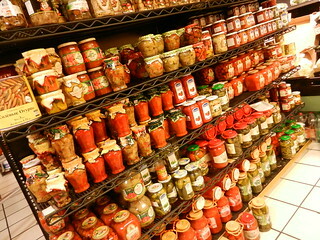 The store specializes in central and eastern European foods, especially Polish. 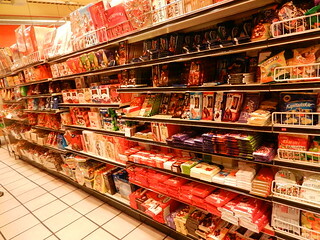 The selection of chocolates and sweets is huge; the packaging is pretty, pictures on labels aid in determining what each item is, I’d like to try one of each. 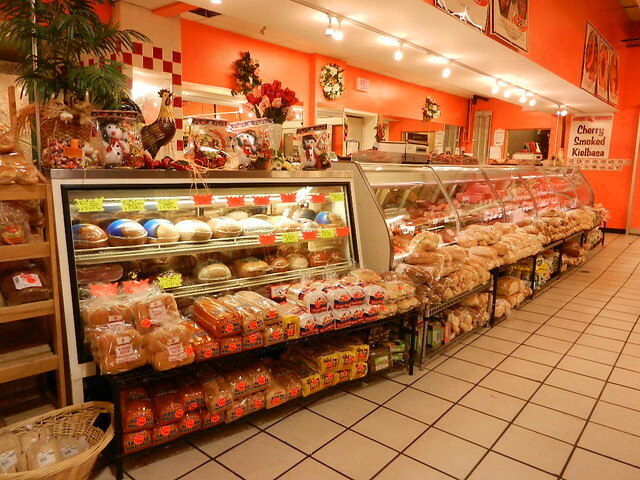 Fresh produce, meats and breads are all reasonably priced, everything looks good. Many of the shoppers speak their native language to store employees, the language sounds soft and kind. Besides food you can find cosmetics, magazines and newspapers written in Polish along with liquor packaged in attractive bottles. Before leaving we revisited the candy aisle and indiscriminately chose a candy bar to share, I’m not sure exactly what it was, but it sure was good! West Park Farmers Market is located in the tiny community of Grosse Pointe Park, and is a fun way to spend a Saturday morning. Colorful umbrellas dot tree-lined Kercheval, they have a bit of everything here, selections change as the season does. Lots of plants for sale; vegetable and flower, gorgeous hanging baskets with flowers cascading down the sides. Produce is limited so early in the summer, but increases as the season progresses. 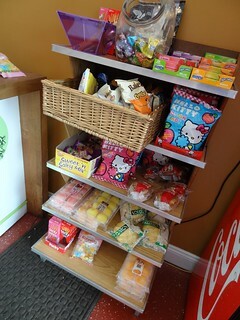 Lots of products to sample, bread, bbq sauce and sweets, it’s all good! 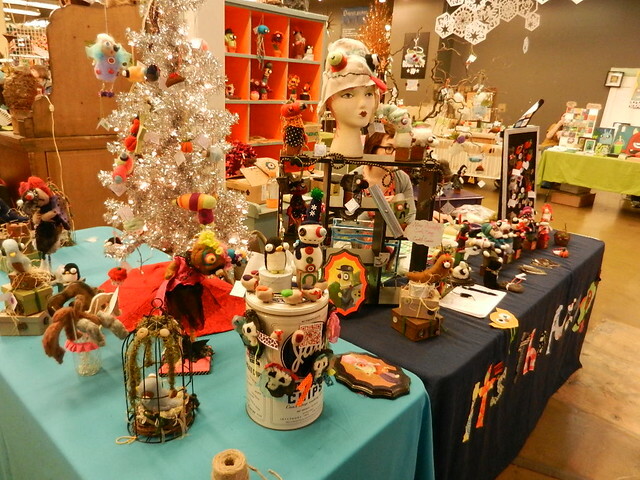 Stone birdhouses, jewelry, and fabric crafts too, it changes up a little each Saturday. A DJ on a corner played mellow tunes as we took in artists works, blue sky and a gentle breeze, it was a lovely day to be outside. The cool thing about this market is that it is right in the center of the city, as you browse the vendors you are walking past cute restaurants and shops, they’re always happy to welcome you in. 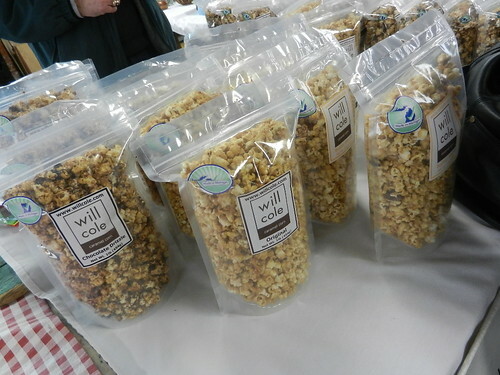 Allow yourself enough time when you come, the market is open from 9:00-1:00, and plan on staying for lunch. The Sprout House Natural Foods Market is located on the corner of Kercheval and Lakepointe. It is like the old-fashioned corner store gone green. In addition to a wide variety of organic and health food products they also sell ready made food items; from sandwiches and salads to soup, let me tell you everything is incredibly flavorful! Our favorite sandwich is the Southwest Avocado, I’m getting hungry just thinking about it, I have no idea what kind of spices they use that can make an avocado taste so good, but it works. The outdoor tables were occupied so we sat in the front window and ate, overlooking the crowds milling about. The dogs looked like they were having as much fun as the people. Our next stop was a little further north on Kercheval in Grosse Pointe Farms. 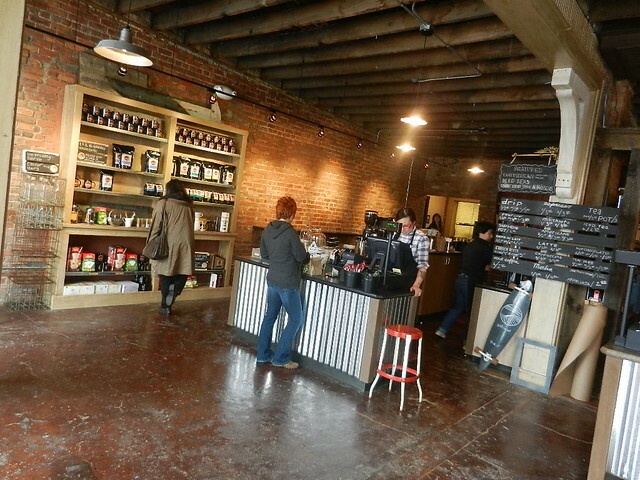 Morning Glory Coffee and Pastries is the latest addition to the city and patrons are giving it a warm welcome. The decor is distinctly European and loiter friendly, both indoor and outdoor seating are available, the weather will guide you. Inside are two sizable glass cases filled to capacity with whimsically decorated cakes sold whole, cupcakes, individual tarts, cookies, eclairs and creme’ brulee’. 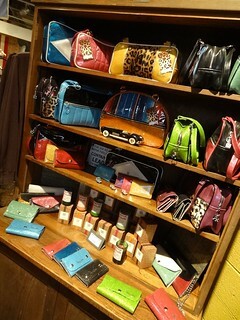 There’s lots to choose from and everything is made in house. We had a slice of the Chocolate Creamsicle cheesecake; a deliciously creamy cheesecake with a small center of orange flavor running through it, topped off with a chocolate ganache, yum! The beverage menu is large, Kris had espresso and I an iced green tea, both hit the spot. 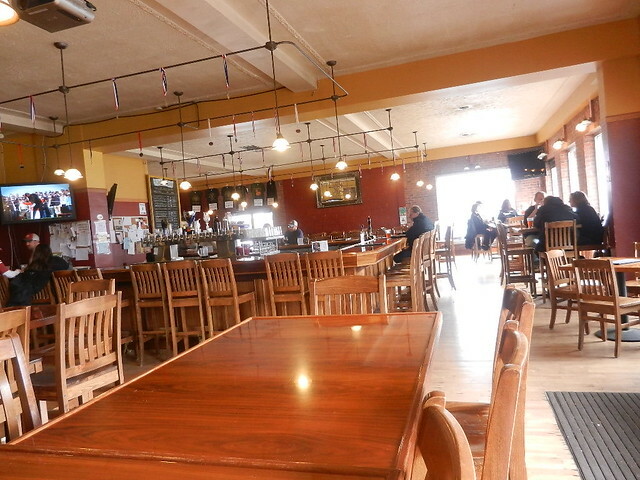 They also serve breakfast and light lunch fare and are awaiting a liquor license, such a lovely place for a light meal or snack, definitely worth seeking out! Just outside Detroit, Grosse Pointe refers to a coastal area of Lake St Clair that is made up of five adjacent individual communities. Often referred to as “The Pointes”, all are lovely, studded with with magnificent homes and have a downtown area, each city has it’s own distinct feeling.